Will you be able to see the ‘demon’ star in the constellation Perseus the Hero tonight? Yesterday’s chart showed you how to use the constellation Cassiopeia to locate Perseus in the northeast at mid to late evening. 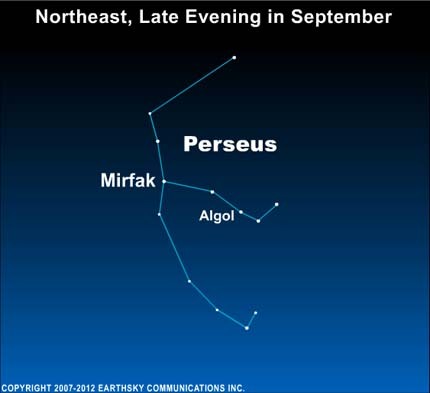 The brightest star in Perseus is Alpha Persei, whose proper name is Mirfak, pronounced MEER-fak. Meanwhile, the best-known star in this constellation is Beta Persei, or Algol, pronounced AL-gul. The name Algol comes from an Arabic term for “head of the ghoul” or “head of the demon.” Algol is a very interesting star. It has known to vary in brightness in a way that is extremely regular. The cycle lasts exactly 2 days, 20 hours and 49 minutes. For a few hours during the cycle, Algol’s brightness falls far below normal, and then returns to normal. 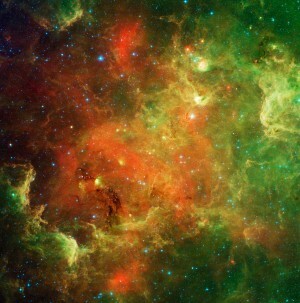 All the while, the star remains visible to the eye. Algol’s brightness variation is not due to some special quality of a single star. Instead, this is a multiple star system, where one star regularly passes in front of another as seen from our earthly perspective. Thus, Algol is what has been called an “eclipsing variable star.” Thousands of these stars are known, but Algol is perhaps the most famous of this class because its periodic dip in brightness can be seen with the eye alone, and because the cycle is relatively short. The ancient stargazers had no knowledge of multiple star systems, but possibly they noticed this star’s brightness change. Perhaps the brightness change is why, throughout parts of the ancient world, the star Algol was associated with demons or monsters. The Greeks and Romans identified the star with the Head of Medusa, a fearful monster with snakes in place of hair. The star has also been called The Ghoul Star. Northern states see Perseus by nightfall or early evening. Observers in the southern states must wait till mid or late evening to catch Perseus and the ‘demon’ star in the northeast sky. Site contents copyright © 2019 Recorder Online	except as noted. All rights reserved. | 87 queries in 1.131 seconds.